In my opinion, the longer your hair gets, the harder it is to make a standard messy bun. And, as you may have noticed, The Princess's hair is getting quite long! I'm so excited we stumbled upon this method, because this messy bun (shown in our video tutorial below) is super easy and fun to make! 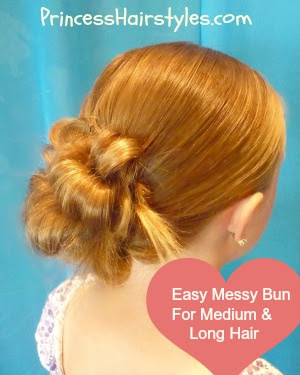 We have tried lots of different ways of making messy buns and I think this is our favorite for long hair & medium hair. I love the "rolled" look of this bun without all of the effort that these types of updos usually require. I'm thinking this bun is casual enough for every day wear, or could even work for a special occasion like a Homecoming or Prom hairstyle. 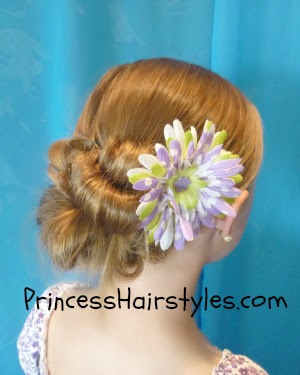 In the photo above, we accessorized the bun with a cute flower clip. I think this would look adorable with a headband or other accessory as well. As I mentioned in our video, we actually came upon this bun quite by accident. 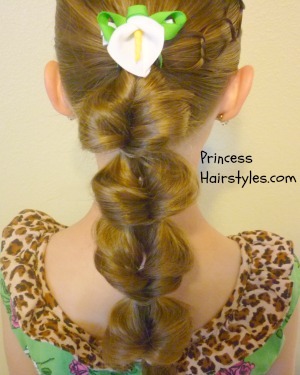 The Princess was wearing a "flip braid" one day before a soccer game and wanted all of her hair up and out of the way for the game. So, instead of taking the flip braid out, we wrapped it all up into a bun and this hairstyle was born! Great photos. I'll have to give it a try. Come over for a visit sometime. Wow this looks like such an easy way to creat a messy bun!!! Wow,what a great and awesome look.These hairstyles are so beautiful and have a gorgeous look. Additionally, wearing your hair down could become hot and uncomfortable by the end of the evening. A French twist, brain, bun, or other up-do might be a good choice. The first one looks so great!! 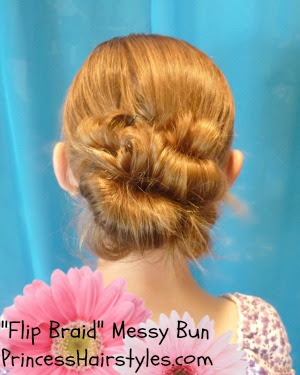 I do hair for dance competitions and I've been looking for a good messy bun for one of my girls who's hair is down to her bum and very very thick, I'm going to try this and hope it works. Thanks so much! I did this messy bun for a very formal Military Ball...it turned out GREAT! My husband is the one who actually did my hair- and used the video to learn- thanks so much for posting these vids!